​​Danielle Turk is a senior at Sugar Land Preparatory Academy and is a part of the Class of 2018. 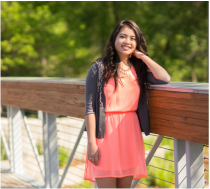 She started SLP as a 6th grader, and has since then established herself as a role model and leader to her peers. After a grueling application process, Danielle is now reaping the rewards of her hard work. She has been accepted to 12 colleges, and is now faced with deciding where she will spend the next four years. The 12 colleges consist of Emory, Northwestern, Northeastern, Auburn, Alabama, UCLA, University of Arizona, LSU, Fordham, Notre Dame, Emerson, and UT Austin. Danielle would like to major in Communication or Business. What is the key to her success? While her high ACT scores gave her a leg up in admissions, Danielle contributes much of her success to her strong essays and extracurricular activities. She recommends investing time in activities that align with your passions and goals, rather than merely joining a multitude of activities solely for the purpose of filling up a resume. When it comes to essays, Danielle says, it’s critical to find your distinct voice and write about something unique. We are so proud of Danielle and cannot wait to see what she accomplishes in college! SLP is proud to celebrate our 10th anniversary! ​Hurricane Harvey brought unprecedented flooding and destruction to the city of Houston. Sugar Land Preparatory Academy’s 9th grader Safiyya Patanam saw this as a chance to make a difference in the lives of those affected. To help with Harvey relief, Safiyya cleaned up debris, gutted houses, packed toiletries, and distributed bedding, clothes, and food for refugee families. This was made possible by Safiyya’s constant involvement with the Islamic Circle of North America, a nonprofit organization that provides disaster relief to those in need. In addition to engaging in Harvey assistance, Safiyya’s numerous philanthropic activities include tutoring a refugee family from Afghanistan, organizing the ICNA South Central Regional Convention, and helping out at her mosque during carnivals and events. It’s not unusual to find Safiyya and her family giving back to their community; they are deeply involved in ICNA Relief Houston and regularly participate in charity events. Referring to her tutoring of the kids from Afghanistan, Safiyya says that seeing the children progress in their studies is an overall humbling and satisfying experience that gives her a great sense of pride. In recognition of her hard work, Safiyya recently received the President’s Volunteer Service Award. This award is given to honor volunteers who have dedicated themselves to multiple hours of service. So far, Safiyya has volunteered a total of 124 hours. Safiyya continues to tutor the refugee family and help with ICNA Relief packing and distributing events. Sugar Land Prep is very proud of Safiyya and all she has done for the community. We know we will see great things from her in the future! Way to go, Safiyya! When Saman arrived to SLP as an ninth grader, he was placed in all freshman courses. Despite being in advanced courses, he still managed to complete all of them and go above and beyond to finish two and a half additional math courses - Geometry, Algebra II, and PreCalc A. He would not have been able to achieve so much without the environment at SLP that encourages self-paced and self-motivated learning. When he graduates next year, he wants to be remembered as a good leader that his junior friends look up to. He will be remembered for much more than that, as he sacrifices nearly five hours every week to help his underclassmen get ahead in their coursework. We are so blessed to have Saman as a part of the SLP community. having menstrual products is an issue every woman has dealt with. I decided to help those women who are underprivileged and unable to afford the basic necessities. These women must face this every single month. Believe it or not, menstrual products are the least donated items to shelters, although the need for them is endless. As a woman, this struck a chord with me, and I decided to do something about it. Thus, the Homeless Period Project (HPP) Houston was born. As Founder and President of this chapter, I collect and drop-off donations for shelters and schools, manage the project’s social media accounts, and network with volunteers and other non-profit organizations. After the devastation of Hurricane Harvey, we partnered with the Unmentionables, a non-profit similar to the Homeless Period Project, to host a free shopping event for Harvey’s victims. At this event, I was able to witness first-hand the effect that HPP had on women’s lives; as they walked by my station, the women’s eyes would light up as they stuffed their shopping bags with items that were seldom found in donation bins. I was truly making a difference in my community." Edward Hua, a Class of 2017 Senior at Sugar Land Preparatory Academy, is the definition of ‘well-rounded’; from academics to music to sports, Edward performs remarkably and excels at everything he chooses to do. Edward came to Sugar Land Preparatory Academy (SLP) from Arcadia High School halfway through the 2015-16 school year when he was a junior. Because of the self-paced, individualized learning style at SLP, Edward was able to merge comfortably into the new school. Now an upcoming Cal Poly Pomona freshman, Edward worked diligently to finish his courses this year while maintaining a 4.0 GPA. In recognition of his hard work and extensive efforts, multiple outstanding universities have accepted him, including Boston University and California State Polytechnic University Pomona. Eventually, his hard work will also pay off in his workplace and in his career as a businessman. Academics isn’t the only field Edward excels in. He has been playing the trumpet since he was in 5th grade, and received state recognition for his musical skills. He performed in the Rose Parade, an annual traditional New Year’s celebration parade that has been occurring since 1890. Edward also won gold from the Southern California School Band & Orchestra Association on behalf of his high school. Edward graduated from Sugar Land Preparatory Academy this year, and he wishes to be remembered for being a leader that everyone looked up to and respected. His wish will come true, as he is greatly respected and admired by all of his peers and immensely loved by the staff at SLP. The Sugar Land Preparatory Academy family will miss him tremendously, but they yearn to watch him continue to grow and shine in college, his profession, and his future. Congratulations to Edward and the rest of the Class of 2017! Don't ever forget - "Success, Nothing Less!" It’s not every day you hear the word mridanga in a sentence. In fact, you’ve probably never heard the word before. But for Ananjay Raju, a 7th grader at Sugar Land Preparatory Academy, mridanga represents a big part of his life and culture. What does mridanga mean? A mridanga is an Indian drum shaped like a double sided cone. In ancient times, it was played in Karnataka music and was believed to be heard in the heavens. One side of the instrument has a lower pitch than the other side; this allows the drummer to create a musical medley of high and low sounds. Ananjay has been playing this unique instrument since he was four years old. Recently, he was given the opportunity to work with a successful mridanga player. Ananjay would meet with this musician yearly and go over Ananjay's techniques on the instrument. Ananjay was given the chance to perform at his temple, and he traveled around the city to perform. It’s clear that Ananjay shines just as brightly academically as he does musically. This year he was able to earn State Recognition for Duke TIP by taking the ACT. He's traveling with his family this week to receive his medal at the Duke TIP awards ceremony in Dallas! By earning a 23 on the English section, Ananjay was able to score in the top 5% of all juniors and seniors in the nation. Here at Sugar Land Preparatory Academy, we make sure our 7th graders are ready for success in the Duke TIP program. Ananjay and many others go through our intensive preparation and countless hours of hard work in order to achieve this high honor. We are extremely proud of Ananjay’s ability to succeed in everything he attempts, especially qualifying for Duke TIP and playing the mridanga. ​When do you start preparing for college? What about for your career? Omer Loya started his preparation in 7th grade, when he began learning and implementing advanced concepts such as ethos, pathos, and logos in his middle school coursework. His implementation of such concepts not only allows him to outdo his peers in his education, but will also help him shine in his profession. ​Omer came to Sugar Land Prep a little after the beginning of the 2016-17 school year when he was in 7th grade. Now, as the school year comes to a close, Omer finds the once-perplexing system beneficial and he has taken full advantage of it. By applying concepts like scope-schema-scan-skim, he has raced ahead in almost all of his courses. At his swift pace, he has also managed to achieve A’s in all of his courses, which is a requirement at Sugar Land Prep. Omer has also qualified for Duke TIP and has been practicing extensively to achieve Duke TIP State Recognition by taking an ACT Prep course offered to him by Sugar Land Prep. He has taken the ACT a few times in preparation for the competition. Omer is now awaiting his scores, and hoping for Duke TIP State Recognition, which would look remarkable on his college applications, proving that his hard work paid off. Sugar Land Prep is a small private school located in Sugar Land, Texas that allows it students to prosper and achieve their full potential. The school provides its students with an individualized learning style and healthy competition with their schoolmates as each of them continues along their own path to realizing their own dreams. Sugar Land Prep molds its students into the leaders of tomorrow and aids them as they continue to fulfill the school’s motto, “Success, Nothing Less”. Each of you holds a permanent and unique place in my heart. You are each positive role models. You have left a legacy at SLP. The ending of the SLP school year video was spectacular. Locking and unlocking the doors at SLP will never be the same for me. Your future seems unknown to you now. There is a saying, "Be bold enough to use your voice, brave enough to listen to your heart, and strong enough to leave the shore." I am looking forward to your future. ​I know you will all continue to leave your legacy on the world. So the adventure begins. Your words, actions, and choices are like your pen. I am certain each of you will write a phenomenal success story. I am blessed and feel sincerely grateful we shared our time together. ﻿Ruth Abramczyk- Being a student at SLP has been amazing. My favorite moments from school include simply being around my friends. I have met some of the greatest people at SLP and I could not have made it through high school without them. In the fall, I will attend the University of Houston and major in Education. Although I was accepted to many other Texas area schools, I chose to attend UH because it best suited all of my needs. I received an Academic Excellence Scholarship, and I cannot wait to see what the future holds. While in high school, I participated in the Dual Credit program with HCC, and I completed 2 semesters of College English. I also completed the College Mathematics CLEP test. During my high school years, I have been actively involved in the Girl Scout SPURS program at Camp Misty Meadows in Conroe. Through this program, I have learned leadership and teaching skills, which led me to pursue a degree in Education. I have earned the highest leadership level in the program, as well as completed over 100 hours of service each year earning me the Presidential Service Award, annually. I was a member of the Girl Scouts Parade team, representing the program in the Houston Livestock Show and Rodeo Parade. I also served as President, Historian, and Secretary with SPURS. I have also been a member of the Harris County 4H Gaited Drill Team. We perform and compete synchronized routines while on horseback, even performing at the Kentucky Horse Park in Lexington, Kentucky. I have served as president of the local 4H chapter this past year. Hannah Blankenship- I have enjoyed serving at Second Baptist Church and participating in Lambda Chapter National Honor Society, FCHE choir, and volleyball during my high school years. I love horses and have had so much fun riding and competing. I have received a total of $315,000 from the 5 colleges I applied to. I will enter college with 18 hours of dual credit from taking classes at Lone Star College. Some of my SLP accomplishments include completing the Honors portion of chemistry and graduating with the distinguished diploma plan. All of the lock-ins, field trips, and spirit weeks have created great memories for me. I will definitely miss SLP, but I’m excited to go to Houston Baptist University this fall! I plan to study chemistry so I can achieve my goal of becoming a physician. I decided to attend HBU because of its excellent pre-med program and its close proximity to my home. Go Huskies! Karis Blankenship- Over the past five years I have been attending SLP, I've enjoyed various field trips, group activities, and fellowshipping with this outstanding group of students. Perhaps one of my favorite memories from SLP was when I finished three years of math in one school year, therefore motivating the younger students to do likewise. I have also been involved in horseback riding, volleyball, track, National Honor Society, choir, and serving at Second Baptist Church. I'm excited to announce that I have been offered a total of $98,000 from the two colleges I applied to, and I have earned 18 hours of dual credits. After high school, I will be studying Animal Science at West Texas A&M University in pursuit of my goal to become a veterinarian. I have chosen West Texas A&M because it has a distinguished pre-veterinary medicine program, and I will be trying out for their competitive equestrian team as well. Go Buffs! Seth Blankenship- Some of my SLP highlights are completing the distinguished diploma plan, getting 15 hours of dual credit, getting to work with the most amazing and helpful staff any school could offer, and adapting to its unique style of learning which pushed me ahead of my peers. I was able to accomplish all of my academic, athletic, and other goals here and I couldn’t have done it without the incredible motivation, encouragement, and advice from the staff.​activities outside of SLP including Youth and Government, National Honor Society, Choir, C2 Bible Study, Track, Basketball, and playing football for the Fort Bend Chargers. I played in over 50 varsity level games, 3 state championships, was the team co-captain all four years I played, and was selected as First Team All-State in my position in the 2014 and 2015 Seasons. I earned $382,343 in academic scholarships from the 6 colleges I applied to, on top of interest from 15 other colleges to play college football. I will be attending the University of Mary-Hardin Baylor in the fall to study Pre-Physical therapy and pursue football. I chose Mary Hardin-Baylor because of their incredible PT program and the environment. I fell in love with it right when I stepped on campus for the first time! I plan on becoming a Physical Therapist and I’m really excited to see what God has planned for me over the next couple of years! 5-7 sentences, but I was so relieved when I received a 96%. I also took AB Calculus and the AP exam, which was a major accomplishment for me. I applied to five colleges and received a total of $85,000 in scholarship money. I have decided to attend the University of Oklahoma that offered me a $28,000 scholarship. I have chosen this college because they have an astounding health and science program, which will help me pursue my future goal of becoming a DO (Doctor of Osteopathic Medicine). I am excited to embark on this new journey and finally become an OU Sooner! Kinley Stokes- I would like to thank the SLP families for supporting the philanthropy projects that I really cared about. From the Operation Christmas Child shoe-boxes, to the book drives and making crafts and blankets for Texas Children’s Hospital, it was all very rewarding. I was honored to twice receive the SLP Humanitarian Award. I plan to remain at home for my first year of college and take primarily online ​Beginning my sophomore year, I’m interested in attending Baylor University, where I plan to major in Speech Pathology. Baylor has an outstanding program where I can receive both a BA and a MS degree. I am waiting until next year before applying for scholarships. Some of the honors and awards I’ve received include both Gold and Bronze Presidential Volunteer Service Awards. I’ve also received several National Charity League awards including the Mission Bell Award. I was honored that an article was written about me in the “Absolutely Memorial” magazine regarding the book drives I initiated and the philanthropy work I’ve done for Texas Children’s Hospital. I have taken both dual credit English and Government courses during my time as SLP. I am a member of the National Society of High School Scholars, which honors students based on grades, leadership, and service. Lauren Petty was the only graduating senior (2015) this past year. While applying to colleges, she continued to take the SAT and ACT to try to get the best possible score. At the same time, Lauren was keeping up with her academics, worked at the Willowbrook Ice Rink, was a figure skating coach, and competed as a figure skater herself. She applied to two colleges, both of whom gave her scholarships. She was offered the Dean’s Scholarship at Texas Wesleyan, but turned it down. Instead, she accepted a very generous scholarship from HBU, and was also accepted into their Nursing Program. We are excited that Lauren will be staying in Houston, and we are extremely proud of all her accomplishments throughout the years. This past school year, Hannah Blankenship got perfect scores (36) on the ACT’s English and Reading sections. She worked extremely hard on getting those perfect scores, and we are ecstatic that she accomplished her goal. Hannah studied by taking many practice tests and by working hard on her critiques. She says that SLP’s methods of studying for the ACT helped her tremendously, and she would not have been able to make perfect scores without his program. We cannot wait to see what colleges offer her when she starts applying in the summer. What an entertaining and exciting week of spirit at SLP! Kinley BLUE us all away on Colorful Monday. Nicolette tackled Tacky Tourist Tuesday. Alec looked awesome in his arrow costume for Superhero Wednesday. Nicolette and Rafa showed so much creativity with their clown costume for Twins Thursday. And Ruth's darling Darla outfit for Disney Day Friday was amazing! 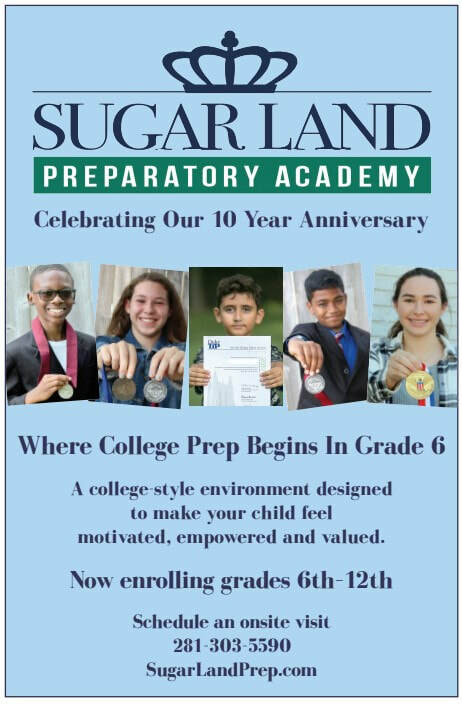 Sugar Land Prep is dedicated to providing our students with learning foundation skills required for success in college and in life. Our students leave with an impressive advantage in learning. We are a school like no other; here, success is the norm.